I usually avoid modern Christian fiction, simply because much of it tends to be brain-deadening fluff with little or no spiritual substance. Thankfully, however, there are exceptions. 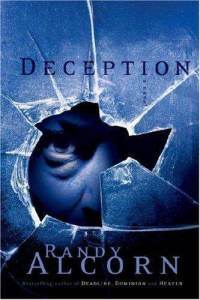 And Randy Alcorn’s crime thriller Deception is one of them. Oliver Chandler is a veteran homicide detective whose rule of thumb is: “Things are often not what they appear.” He’s seen more than he’d care to admit, done more than he’d care to admit. But when he’s called to investigate the grisly murder of a well-known professor at Portland State University, he finds himself going places he never expected – or wanted – to go. The story is intelligent and completely engrossing, with multifarious twists and turns; best of all, there’s a gritty realism to it that makes it thoroughly believable. Alcorn must have done his homework. Plenty of it. Because not only does the story feel real, so do the characters involved. No cardboard, one-dimensional heroes and cheesy villains here. Each person is multi-faceted, interesting, and unique. Particularly Ollie Chandler. He’s a troubled man, angry at God and himself, struggling with the idea that there’s any real meaning in life. His philosophy is simple: there is no justice, there’s just us. The reader can feel his grief and hardened cynicism, and yet rejoice as his eyes are gradually opened to the truth of the gospel. He’s someone you can genuinely sympathize with, and genuinely root for. Cool, I definitely have to check that out. I’ve taken a liking to crime thrillers lately. @Michael: I think you’d really enjoy it. It’s now one of my favorite reads.